This just in: BTP Batreps better than chocolate! I love the Orks. They are are one of the defining forces of the Warhammer 40,000 universe and a lot of fun to collect and play. I have been interested in them or collecting them for the best part of two decades so I know more than a little. What's my understanding then? basic knowledge need never be learnt. Most importantly of all, the natural psychic energy of the Orks sees them drift into ever larger groups and gears them up for war. When an Ork population reaches critical mass it will burst out into the surrounding space and wash across world after world. This is the Ork Waaagh! and it is a force of nature to be feared. The greenskins, as the Orks are commonly known, have been central to Warhammer 40,000 since the origins of the game in the Rogue Trader book of the late 1980s. They featured in the first ever scenario in that very book and were some of the first models to be released for the game. In that first edition alone, they were the stars of not one, not two, but three full sourcebooks! Since then they have been the subject of three more of their very own codices and twice been a starter force, first in the second edition boxed game and now in the current Assault on Black Reach box, on both occasions squaring off against the Space Marines. They even got a major game of their own with Gorkamorka, which saw the survivors of a crash landing battling for scrap across the deserts of a distant world. unleashes them on the enemy. A Weirdboy may develop over time into a Warphead, a psyker of even greater power. 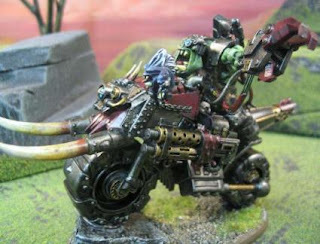 ramshackle vehicles, whether Warbikes, Warbuggies and Wartrakks, the mob-carrying Trukks or squadrons of Deffkoptas, and finally the enormous tank-like Battlewagons, well-armed and -armoured and usually filled with even more Orks. 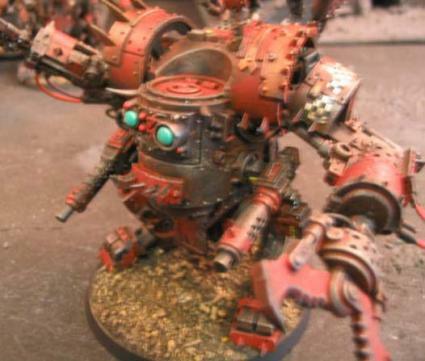 These break down into what might be termed the Ork horde, the Kult of Speed, the Kan wall and the steamroller. feared power klaw. These mobs often charge directly at the enemy and, when the moment, is right let rip with their famous battle cry - “Waaagh!” - inspiring them to even greater feats. The Kult of Speed is broad concept. It certainly consists of a mass of the lighter Ork vehicles, which hurtle forward with riders, gunners and any brave Gretchin crew hanging on for dear life. 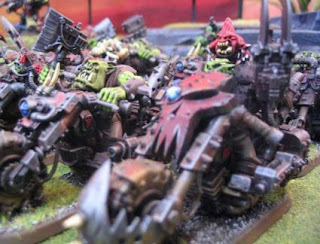 It is also likely to include mobs of Ork boyz and Nobz packed into lightly-armoured Trukks bolted together Gork knows how and racing towards the opponent's lines, while Deffkoptas may buzz over all, loosing off rokkits in all directions. 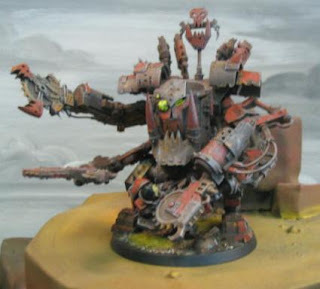 you can fit even more Deff Dreads into an army and really terrify the enemy. The steamrolla sees the army fit in as many of the solid Battlewagons as possible, kitted out with all kinds of Mek toys, including the famous and destructive Deathrolla. With weapons blazing from every opening, the Battlewagons rumble forward to drop their Ork passengers into the heart of the fighting, only the heaviest or most powerful weaponry is able to blast through the layers of thick armour plate. There are several other common units which complement the army types, among them the Lootas with their cobbled-together heavy weaponry, the Stormboyz arcing over the battlefield on dangerous rokkit packs and the Kommandos sneaking forward to set up ambushes. 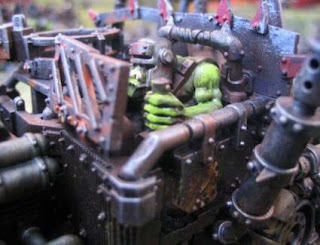 There is also the Looted Vehicle, allowing you to field a great vehicle from one of the other Warhammer 40,000 model ranges, 'improved' and made properly Orky of course. The many specialised units available mean that while the army may seem unsubtle an Ork warboss is able to pull off plenty of low tricks. that several tried-and-tested patterns exist, but experimenting is definitely Orky and the sky's the limit. One thing that can be said is that Orks do not much like cleaning, so dust, dirt and flaking paint are the order of the day. 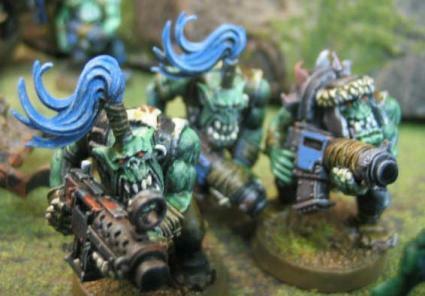 The Orks are often seen as comic relief in a game world which can be grim. Although the comedy has been toned down over the years, the Orks remain an unpredictable army, with weapons malfunctioning and vehicles going out of control left, right and centre. Many units and weapons have fun special rules like this to keep both players on their toes. Their relatively recent and effective Codex: Orks is the icing on the cake and contains far more information than can be covered here, with greater detail and more accuracy of course. 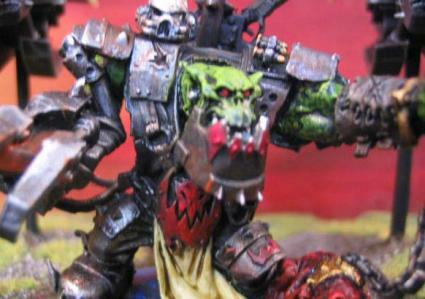 Have a read of it and grab your army - the Orks are more than ready to rumble!